Form M-4852 is a Massachusetts Department of Revenue - issued form also known as the "Substitute For Form W-2, Wage And Tax Statement". 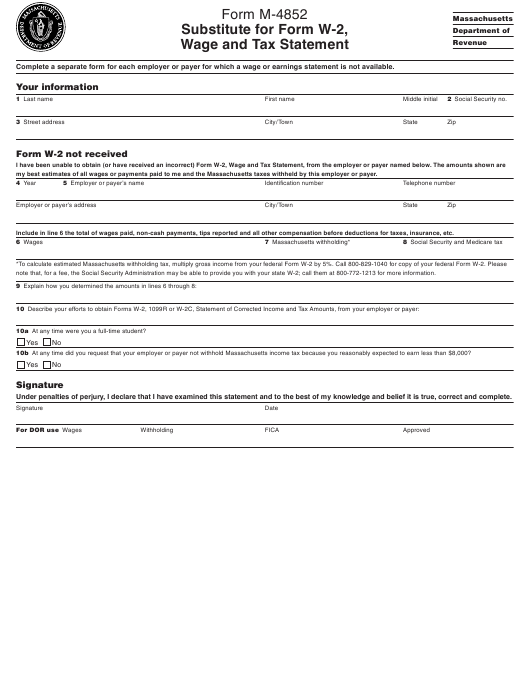 A PDF of the latest Form M-4852 can be downloaded below or found on the Massachusetts Department of Revenue Forms and Publications website. Complete a separate form for each employer or payer for which a wage or earnings statement is not available. my best estimates of all wages or payments paid to me and the Massachusetts taxes withheld by this employer or payer. Include in line 6 the total of wages paid, non-cash payments, tips reported and all other compensation before deductions for taxes, insurance, etc. note that, for a fee, the Social Security Administration may be able to provide you with your state W-2; call them at 800-772-1213 for more information. 10a At any time were you a full-time student? 10b At any time did you request that your employer or payer not withhold Massachusetts income tax because you reasonably expected to earn less than $8,000? Under penalties of perjury, I declare that I have examined this statement and to the best of my knowledge and belief it is true, correct and complete.